Dental implants are considered the best tooth replacement option available. An implant replaces the root of a tooth and allows for the replacement of the crown via attachments or abutments. They not only look like a real tooth, they function like one too. Implants, though, for some are a significant investment and may be well beyond a person's financial means if they've experienced a sudden tooth loss. For that reason, many opt for a less expensive tooth replacement option like a removable partial denture. Later when they can afford it, a person might consider an implant. But this could pose a complication. When a tooth is missing for some time, the underlying bone doesn't rejuvenate normally because it no longer receives stimulation from the tooth. Over time, the amount of bone may diminish. Restorations like dentures can't stop this bone loss and actually aggravates it. For proper positioning, an implant requires a certain amount of bone volume. So, it's quite possible when the time comes to replace the old restoration with an implant that there may not be enough bone available. We may be able to overcome this bone loss with bone grafting and regeneration. A specialist such as a periodontist or oral surgeon accesses the area surgically and inserts bone graft material, usually processed material that's completely safe. 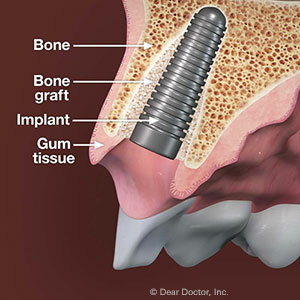 Properly placed, the bone graft serves as a scaffold that, along with growth stimulators, encourages bone cells to grow. When the bone grafting has healed enough, we're then able to place the implant. Once imbedded in the bone, one of the implant's unique qualities comes into play. The imbedded post is made of the metal titanium, which is not only bio-compatible with body tissues, it also has an affinity with bone. Bone cells will easily grow and adhere to the implant surface. This further boosts bone growth in the area and strengthens the implant's hold. These extra procedures to build back lost bone do add to the cost and time for installing an implant. But if you're ready for a more permanent restoration for a missing tooth — not to mention better bone health — the extra time and money will be well worth it.